Inn At Spanish Head, Lincoln City. Have your wedding overlooking the waves at this Lincoln City resort. It boasts 120 guestrooms, and all the banquet rooms face incredible views of the ocean. The El Toro comes with more the 2000 square feet and floor-to-ceiling windows. More intimate weddings can be had at two of the smaller rooms, which are on the ground floor and closer to the surf. Check out the wedding packages at www.spanishhead.com. 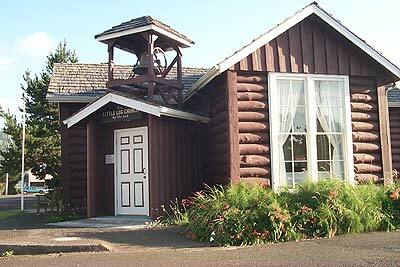 4009 SW Hwy 101, Lincoln City. 800-452-8127. Getting Hitched on the Beach. You do need a permit to have a ceremony on the beach itself, which you can get from the Oregon Parks and Recreation Department. (541) 994-8152. Some popular places for this are Cannon Beach - of course. Hug Point, just south of town, has a bevy of interesting features, such as freaky sea caves, a waterfall, and the remnants of an ancient road that was blasted into the basalt rock. The wild, rugged rocky slabs around Yachats is another favorite with nuptial-types, where the tide creates a consistently dramatic show. 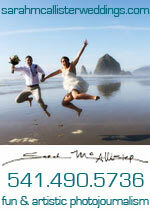 Prime Oregon Coast Beaches for Weddings. Check out the links for details and maps of each suggestion. Some may prefer weddings on a rocky bluff with nice views, so these are mentioned. 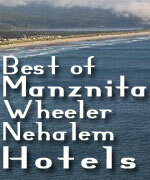 Wedding beaches on the North Coast: Beaches of Warrenton and Gearhart are all soft sands. Seaside is mostly soft sand with a cove area. Cannon Beach has some high vantage points but mostly soft sands, all the way down to Arch Cape. Oswald West State has a cove-like beach while nearby Manzanita and Rockaway Beach are all sandy areas. Garibaldi through Tillamook is along the bay, while Bayocean is beachy sand again. Along the Three Capes Loop: Oceanside has some rocky bluffs with mostly sand. Tierra Del Mar and Pacific City are essentially all soft sands. Some parts of the capes are stunning viewpoints. 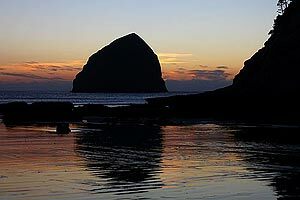 Wedding beaches on the Central Coast: Lincoln City is all broad sandy beaches, while Depoe Bay is mostly rocky bluffs. Newport has the viewpoints at Nye Beach and Yaquina Head, while most of the area is soft beaches. Seal Rock and Waldport are primarily soft sands, while Yachats has a variety of rocky bluffs and viewpoints full of ocean drama that are large enough to accommodate small crowds. BeachcombersNW.com. A massive site listing rental homes that fit any criteria, such as romantic retreats, families, pet friendly houses, ocean front, ocean views and hot tubs - including a special link for large groups and wedding situations. 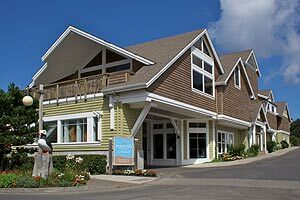 BeachcombersNW includes a rental locator map, annual events calendar, seasonal specials listings, newsletter sign up, availability request forms, quick & easy rental search results, and much more.